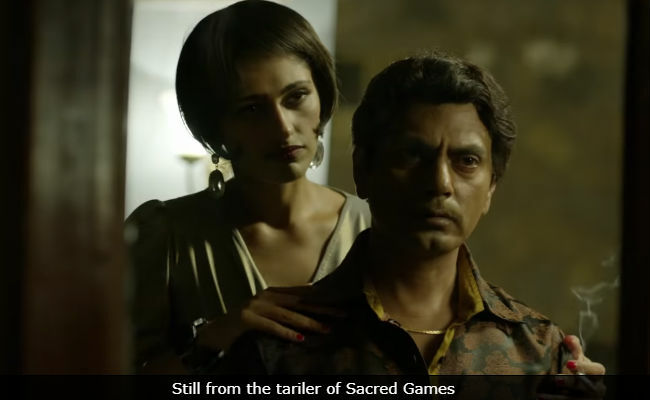 Actress Kubbra Sait was reportedly trolled on social media for supporting her Sacred Games co-star Nawazuddin Siddiqui after he was named in the #MeToo account of his former girlfriend Niharika Singh, with whom he co-starred in Miss Lovely. "But I don't care about those who want me to say what they want to hear. Why should I not stand by Nawaz just because he is a man? Do men always have to be in the wrong? It may be the politically correct thing to demolish the reputation of a man accused by a woman. But where is the proof?" she told news agency IANS. Kubbra added: "You can't rant against someone and be taken seriously. If she (Niharika Singh) said Nawaz was a bad actor, there would be his body of work to disprove her. But how does one prove a man's guilt or non-guilt when a woman accuses him of sexual misconduct?" Over the weekend, Niharika Singh named Nawazuddin Siddiqui in her #MeToo account and accused the actor of forcing himself on her. Niharika added that she resisted initially but eventually gave in. Nawazuddin Siddiqui has not addressed the accusations levelled against him. A day after Niharika's #MeToo account (also shared by journalist Sandhya Menon, who is one of those leading the #MeToo campaign on Twitter) went viral, Kubbra tweeted: "A relationship gone sour, isn't #MeToo someone needs to recognise the toxic difference before we go picking sides... I stand by #NawazuddinSiddiqui... I stand by the fact that although Niharika Singh may have had a tough time in the industry, categorising her once personal relationship as a #MeToo statement is incorrectly placed." I stand by the fact that although Niharika Singh may have had a tough time in the industry, categorising her once personal relationship as a #MeToo statement is incorrectly placed. We as humans are flawed. That isn't gender specific. Speaking to IANS, Kubbra elaborated: "You can't pull a relationship out of its personal space for your own purpose. There is a man's reputation involved. I read her comments 7-8 times. But they sound like she is venting her own frustrations and rage against someone who has overcome his own struggles to become successful." "It is being said that the #MeToo movement can succeed if some important influential names are called out. We can't just pull up anyone's name and fling it in the mud. Comments such as hers are derailing the #MeToo movement," said Kubbra, who played the role of transgender cabaret dancer Cuckoo in Sacred Games. Kubbra also added that neither does she know Nawazuddin Siddiqui beyond the work they did together and nor does she have a personal interest in supporting the Manto actor as she doesn't star in the second season of Sacred Games. "I don't know him personally beyond the work we did together in 'Sacred Games'. He is not a friend. I don't know him socially at all. But I've seen how courteous and soft-spoken he is with his co-stars." "For those who think I am defending him to save Sacred Games and my own role in it, I've news. The second season has started shooting. And I am not in it. My role is over. This is not about self-interest. It is to safeguard the #MeToo movement from being derailed," she added. Kubbra Sait said that blaming others for one's own wrong choices is incorrect. "I've made many mistakes in my life and career. I've been in relationships that I've regretted. And I've done a web series in the past which makes me cringe. But at that point of time I needed any work that came my way. If you make wrong decisions in life, it isn't right to blame them on others, especially if they are far more successful than you. Such accusations and allegations look like vendetta," she said. Kubbra Sait has also featured in films such as Ready and Jodi Breakers and she will next be seen in Gully Boy, co-starring Ranveer Singh and Alia Bhatt.